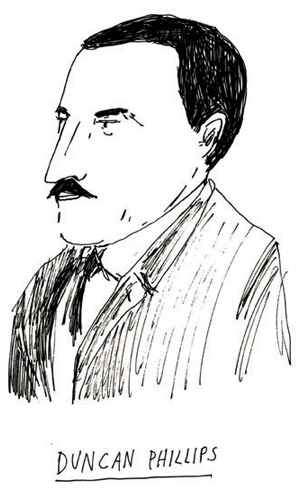 An illustration of Duncan Phillips, founder of D.C.'s "Best Museum", by D.C.'s "Best Local Illustrator" Elizabeth Graeber. Today Washington City Paper released the results of its 2012 “Best of D.C.” readers’ poll. We were very excited, proud, and grateful to see The Phillips Collection in first place for both Best Museum and Best Art Gallery for a third consecutive year. While we don’t fit perfectly into the “art gallery” category (an understandable mistake, as even our original name confuses the issue), we so appreciate all of you for showing the love. Degas’s Dancers at the Barre was a runner up in the Best Exhibit category, behind the Corcoran‘s important 30 Americans show (which included work by William Pope.L who we’re excited to spend time with next week at the final Conversations with Artists program of the season). Last but by no means least, we would like to take this opportunity to publicly high five the talented Elizabeth Graeber–last seen behind the counter in the Phillips museum shop or admissions desk–on earning City Paper‘s staff pick for Best Local Illustrator. Her work for this blog has infused it with creative energy and a hand-made aesthetic that’s right on point for a blog about the creative processes of staff at America’s first museum of modern art. Readers’ Choice: Is this the best D.C. blog? The Experiment Station is 31 days away from its 1st birthday. For all of us contributors, the past 11 months of telling stories about our creative processes as staff at an intimate museum has been a whirlwind of inspiration, laughs, surprises, and–of course–experiments. We think about you, our readers, as we do our work at the museum, brainstorming what kinds of things you might like to know and see, and what kinds of things you might like to tell us if we think to ask. If The Experiment Station has come to mean something to you, as it has to us, we humbly invite you to vote it Best Local Blog/Blogger in Washington City Paper‘s 2012 Best of D.C. Reader’s Poll. Whether or not you decide to vote, thanks for experimenting with us!